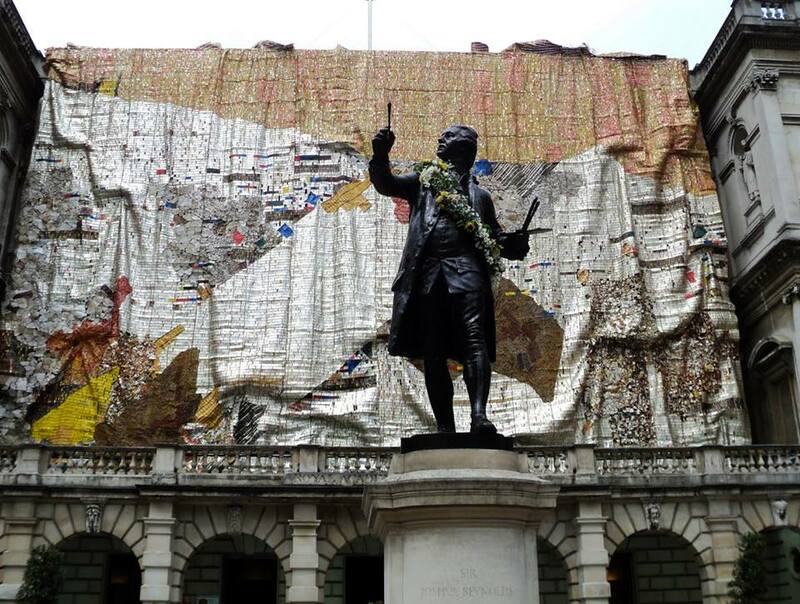 El Anatsui, ‘TSIATSIA – searching for connection’, 2013. Aluminium, (bottle-tops, printing plates, roofing sheets) and copper wire, 15 x 23 metres. El Anatsui began to manipulate broken ceramic fragments in the 1970s. In the 1990s, Anatsui made a crucial shift from working with hand tools to carving with a power saw, which enabled him to cut through blocks of wood, leaving a jagged surface that he likened to the scars left by European colonial encounters with Africa. In his most recent metal wall sculptures, which have brought him global acclaim, Anatsui recycles bottle caps from a West African distillery in his home town, piecing them together to form monumental curtains. It has sometimes been said that these sculptures and other of his artworks are about recycling, but that is not true. Anatsui is ardent that his use of found materials is about transformation—giving objects new lives as they are transformed into something else. El Anatsui is a Ghanaian sculptor active for much of his career in Nigeria. Anatsui was born in Anyako, and trained at the College of Art, University of Science and Technology, in Kumasi, in central Ghana. Very interesting. Thank you for the post. I’m sharing. love the vibrancy of the colours and great to see the process of making and working out how to use the different shapes. agree, it’s fascinating to get to see the production process, I guess this post could also be called the beauty of handicraft.